I am now part of Matinale Digitale, a digital community from Nantes. This community helps me to have more visibility and new opportunities. Long Ma (Chinese: 龙马) was a fabled winged horse with dragon scales in Chinese mythology. Long Ma is a horse dragon created in 2014 by La Compagnie La Machine (Nantes, France) as a gift to Beijing to celebrate the fiftieth anniversary of diplomatic relations between France and China. Long Ma was presented for the first time in Nantes the august 14th 2015 during Le Voyage à Nantes. I filmed it the august 20th 2015 with a beautiful sunset. I loved to shoot this giant horse dragon with amazing sunlights. It was also the first time I used my new Canon 100-400 mm, I definitely love it, the image quality is awesome! I edited this film on a music which inspires me a lot (Apparat – PV) to give a special atmosphere to this short film. I have a new Canon 100-400 mm f/4.5-5.6 L IS ! With an APS-C format camera (like my Canon 60D), it gives me a 160-640 mm thanks to crop factor (focal length multiplied by 1.6). This lens is perfect to shoot surfers ! I was interviewed by Surfing L.A for Surf Session Magazine. It was a pleasure to explain how I began filmmaking and to talk about my projects. 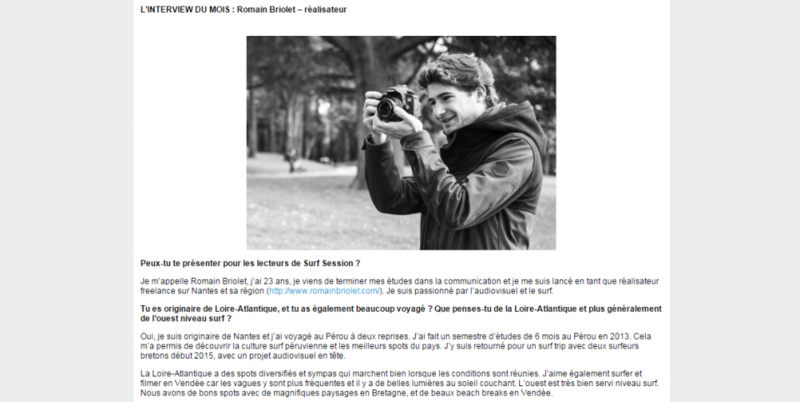 I talked about my project Over There, a new webserie about surftrips in original places. Thanks Surfing L.A for the interview!